The V-R7000 and V-R7100 are Andriod™ based POS terminals highlighted by a 15.6” wide touch screen in a thin ergonomically designed cabinet and pedestal. The V-R7000 and V-R7100 utilize Android™ software version 4.2 (jelly bean). Similar to the V-R100, the V-R7000/7100 POS terminals are designed without a fan, hard disk drive or any movable components to ensure efficient store operations by eliminating common hardware problems experienced with PC based hardware. These new terminals are open platform POS terminals that will run 3rd party Android™ based software applications. Additional applications available on the V-R7000/7100 include grocery/convenience store, pizza, concession stand, hospitality and apparel store. Casio provides a software development kit (SDK) to POS software companies in order to facilitate their software running on these new models. Unlike the V-R100, the V-R7000/7100 will not be embedded with the Casio POS application. The Casio application designed for hospitality and retail applications will be offered as a minimal priced option. 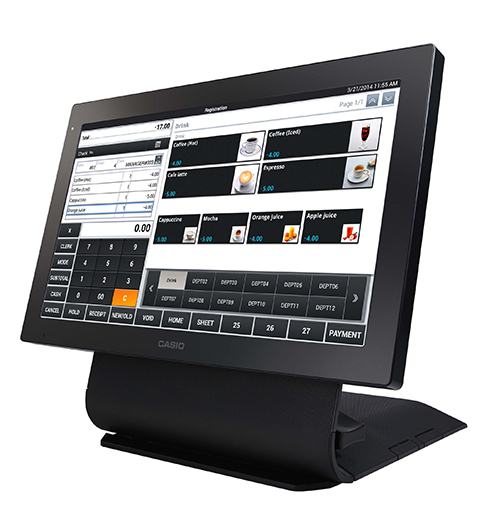 The Casio application offers features such as multiple menu screens, price levels, graphical icons on menu keys, modifier windows, fire messages (both fixed & on the fly), kitchen printer interface, electronic payment interface, operator detailed sales tracking and extensive TCP/IP communications locally and remotely. The V-R7000/7100 also come with extensive hardware offerings that include; three (3) serial ports (and an optional external expansion box that provides additional COM ports), multiple USB ports, LAN port, HDMI port, two (2) cash drawer ports and two (2) SD Card slots that provide resellers and developers flexibility for peripheral connectivity. The V-R7100 has two (2) additional hardware features; wireless LAN (IEEE 802.11a/b/g/n) and Bluetooth communications to create an aesthetic install by eliminating cabling and allowing the V-R7100 to be installed in areas without wired LAN’s. Both models are also equipped with a battery to protect memory data in the event of a power failure. Once the power returns the V-R7000/7100 it will go directly to the screen at the time of the failure without the loss of transaction data.